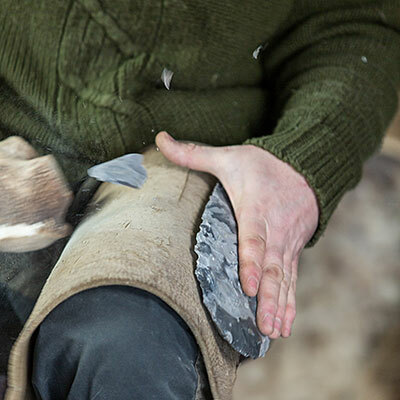 Flintknapping may be a pre-historic craft, but the skills have been kept alive by a small and dedicated group of individuals. Understanding how our neolithic ancestors made tools, weapons and decorative items from flint, chirt and obsidian has greatly increased our understanding of their every day lives. You can experience this fascinating craft by visiting one of the numerous demonstrations I hold around the country each year. Or for a “hands on” experience where you can learn how to shape flint yourself, why not attend one of my workshops for personal tuition. Demonstrations for groups of all sizes. Workshops for individuals, small and larger groups – learn how to flintknap!